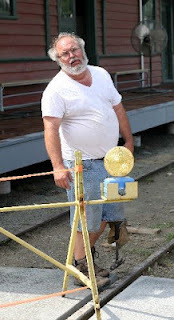 Now that everyone is in recovery mode after the great "Evening at the Depot" on Saturday, Bob Behal has had a little time to start processing his photos of the platform construction. Here are some of his first offerings, with Jim West, below, the HPG board chairman and depot project manager, kicking things off. By the end of the platform construction, note Jim's expression in a follow-up shot! Don supervising as Brian works! 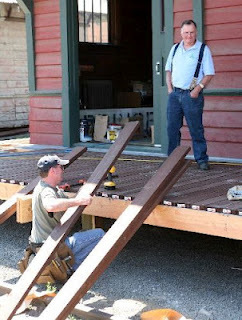 "An Evening at the Depot"
Saturday morning found Bill Warner and others down to the wire on finishing the platform before "An Evening at the Depot" kicked off﻿. In a matter of hours, Bill and others were back on that same platform, enjoying a lively theater presentation and great music wafting from the freight room, visiting with friends, and sampling plenty of scrumptious desserts. People came and stayed for the whole evening, listening to the sounds of Charlie Sutton and Henry Willard, We Are Not Brothers, and Forgotten Freight. But there was quite the prelude leading up to the laid back evening! Before things kicked off, there was some last minute finish work on the platform, wrapping up around 3 pm. When APOD Theatre showed up to practice for its performance, Jim West quickly went to work on clearing the stage and adding some lighting. Meanwhile, the theater group got ready on the platform, including doing some last minute costume prep. 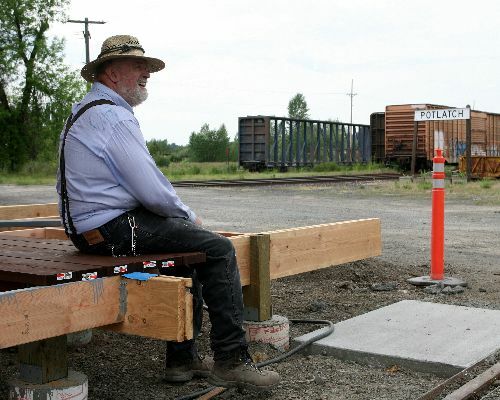 Ironically, during the heyday of the Washington, Idaho and Montana Railway, people sometimes jokingly referred to the little short line as "the Washing, Ironing and Mending" Railway. It was fitting then that Paul Bauer should be out on the brand new platform, ironing costumes before the actors took the stage in the freight room! 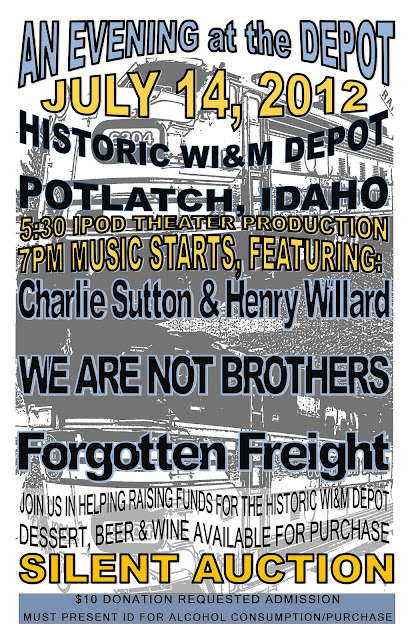 Once the theater acts were over, Charlie Sutton and Henry Willard took the stage.... These two guys are great musicians and also great supporters of the depot, having christened the Freight Room Stage as the first musicians to perform on it, along with Jim and Becca West. Then it was on to the good tunes by "We Are Not Brothers." 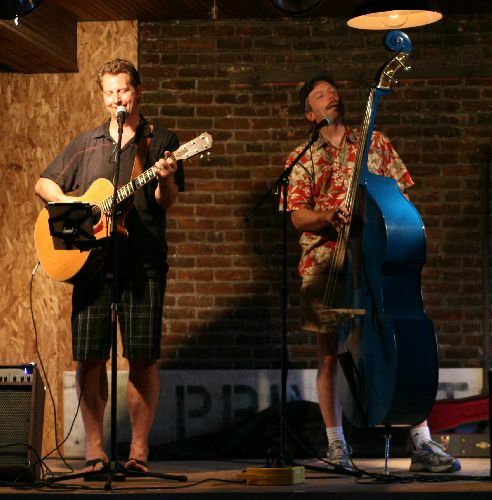 Yes, there is a striking resemblance between the musicians, but Jim West (the evening's MC), left, definitely doesn't look like part of the family tree! As the bands delivered on the music, Karen Rohn and Gary Hayden delivered on the beverages and desserts, and also presided over the silent auction. Karen of course is on the HPG board, and runs the Company Store on the weekends with Don Somers. But Gary also needs to be recognized as one of the best depot supporters around. Thanks Gary for all you do! 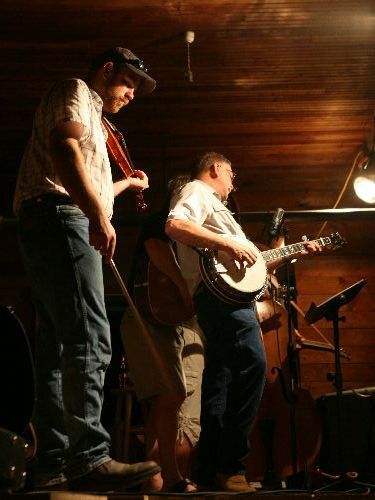 And inside, on the Freight Room Stage, Forgotten Freight kept up the tempo with some fine bluegrass. That's hometown boy Stuart Osborne on the far left. Stuart also does some excellent fiddling. And who should show up Friday morning but our phantom board member Paul Kimmell (that's him on the right with our Jolly Jim)? Don't kid yourself. 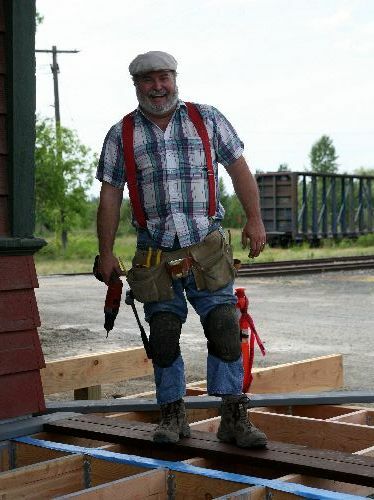 Paul has been the depot's patron saint for years. But he said it was time he put some sweat equity into the old building, so he joined Friday's work crew to bump up the tempo and get the platform done before the Saturday concert. By the way, Jim was up and at 'em at 4:30 (no, I wasn't there to prove it), doing his level best to get that darned platform done. 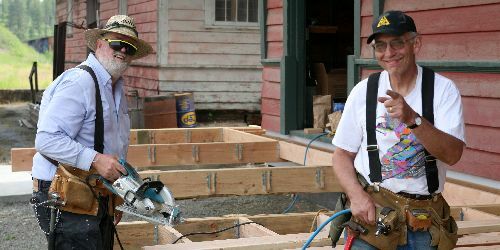 Here's the action around noon Friday, as Kenny and Dave Cada presided over the hammering and drilling (they were tending to other chores inside). Also, thank you Jon Anderson for once again coming out to help (that's Jon on the far left). Jon was one of he earliest workers on the depot, many years ago, and he still helps out when he can. Meanwhile, inside, Kenny, Karen Rohn and yours truly (Barb) set up the silent auction and tidied the ticket room We have some amazing things donated, including two pies from Michelle French﻿ and a bundt cake from Caryn Brown (Don Somers was on hand to open up the Company Store during all this and provided amusing tales of getting his yearly firewood). And Dale Spring from the Wagon Wheel deserves a halo for kicking in much of the wine and beer for the Saturday event!!!! And the City of Potlatch donated chairs and tables for the eveing, plus the catering license. This is an "I think I can" sort of town!!!! See you Satuday night at the depot!!!! The Sign is Back !!! 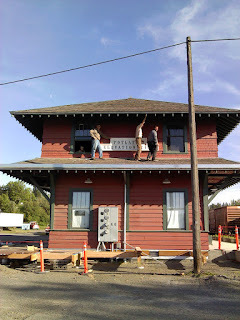 Last week some of us were so busy with the visitors from the Milwaukee Road Historical Association convention that we failed to look up and see that the old "Potlatch" sign is back in its rightful place. Someone caught Webb French and sons on camera so we know who to thank. It looks great, guys! Many thanks. 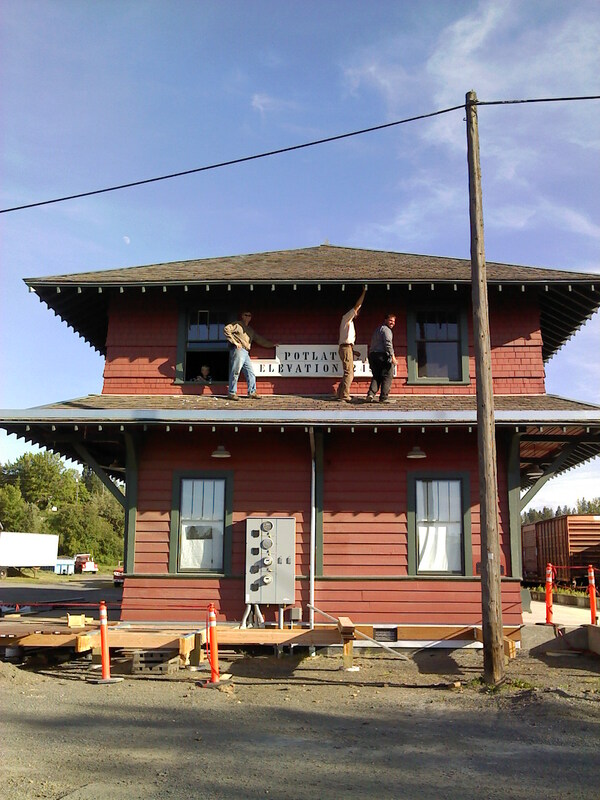 By the way, the sign has long been hung up on the little depot in the park, but that depot came into town from Princeton. Incidentally that little depot is sporting a new paint job and looks very nice!